In 2013, the City began to address the aging infrastructure in the core of the Central Business District with portions of Pierce Street from Maple to Merrill and Merrill Street from Pierce to Old Woodward. In 2016, Hamilton Avenue was reconstructed from Old Woodward to Woodward Avenue. These projects included new water lines, sewer lines and roads. In 2018, efforts continued in the Central Business District into larger areas involving both Old Woodward and Maple. These areas had some of the oldest water and sewer lines in the City, as well as a streetscape that was on a different grade than the road. Much of the old infrastructure was installed in the 1940s and had exceeded its useful life. The planned phases are outlined in the graphic (see right). The 2018 Old Woodward Reconstruction project addressed the infrastructure needs in that area. Upgrades included new larger water lines to improve water pressure, consolidation of sewer lines to improve flow capacity and reliability, removal of the double curb in certain areas, enhanced crosswalk accessibility to comply with modern ADA standards, removal of brick pavers and integration of modern streetscape standards. To address failing conditions, a complete road infrastructure project has been planned in phases over the next several years to further address the infrastructure replacement needs for the downtown. We recognize this work, while necessary, will be disruptive as it occurs. Efforts are planned to help mitigate this disruption during construction with such initiatives as promotional campaigns, downtown valet services and enhanced communications during construction among others. See below to learn about incentives offered during the 2018 project. The Birmingham Shopping District offered FREE Two-Hour Valet Parking (then $5 for each additional hour), Monday through Saturday, 10 a.m. - 6 p.m at four locations in downtown Birmingham. The Birmingham Shopping District offered shoppers an opportunity to submit their receipts from eligible merchants and restaurants to receive Birmingham Bonus Bucks, which were used like cash at participating BSD businesses. Art students, enthusiasts, professionals and BSD businesses enhanced the construction barricades and added something special for those walking throughout town during construction. The community voted for their favorite art panel, which was displayed in the downtown area for all to see and enjoy. Watch the Old Woodward Reconstruction Ribbon Cutting Ceremony on August 11, 2018. BSD Executive Director Ingrid Tighe and Katie Ray Johnston (owner of Sundance Shoes) talked about Birmingham's grand reopening and the Day On The Town event held on August 11, 2018. August 6, 2018, - Download the August 6 construction project update. August 2, 2018- Download the August 2 construction project update. July 27, 2018- Project reaches 95% completion! Download the July 27 construction project update. July 20, 2018 - Download the July 20 construction project update. July 13, 2018 - Project reaches 80% completion! Download the July 13, 2018 construction project update. July 10, 2018 - Download the July 10 construction project update. July 3, 2018 - Please note that eastbound Brown at the Old Woodward intersection is now open to through traffic. July 2, 2018 - Download the July 2 construction project update. June 29, 2018 - Download the June 29 construction project update. June 22, 2018- Project Reaches 75% completion! Download the June 22, 2018 construction project update. June 18, 2018 - Download the June 18 construction project update. June 15, 2018 - Download the June 15 construction project update. June 13, 2018 -Download the June 13 construction project update. Brown St. to close temporarily starting June 14. For a map showing the closing and alternate routes, follow the June 13 link. June 12, 2018 - Project reaches 60% completion - Read more in the June 12, 2018 project update. June 8, 2018 - Download the June 8 construction project update. June 7, 2018 -Download the June 7 construction project update with information about a temporary closure of Brown Street on June 8. June 4, 2018- Download the June 4 construction project update. June 1, 2018- Download the June 1 construction project update. May 25, 2018 - Download the May 25 construction project update. May 24, 2018 - Download the May 24 construction project update. May 21, 2018- Download the May 21 construction project update. May 18, 2018- Download the May 18 construction project update. May 11, 2018 - Download the May 11 construction update. May 7, 2018 - Download a construction update with some of the anticipated work for this week. May 4, 2018 - Download the latest information from the May 4 construction update, regarding water shutoffs planned in the construction area. May 3, 2018 Afternoon- Download the latest information from the May 3 afternoon updates regarding water shutoffs in the construction area. May 3, 2018 -Download the May 3 construction update, with information on the Eastbound Maple shutdown continuing until Friday, May 11, 2018. May 1, 2018 - Download the May 1 construction update which details plans for connecting buildings to the new water main. April 30, 2018 -Download the April 30 construction update. April 27, 2018- Download the April 27 construction update. April 25, 2018- Download the April 25 construction update. April 24, 2018 -Download the April 24 construction update. April 23, 2018 - The fifth week of the Old Woodward Reconstruction Project is underway. Download a construction update with some of the anticipated work for this week. April 22, 2018 -Please note contractors are continuing underground utility work at Old Woodward and Maple. The intersection and traffic along Maple will remain closed on Monday, April 23. April 20, 2018 - Download a construction update which details plans for the upcoming weekend. April 16, 2018 -The fourth week of the Old Woodward Reconstruction Project is underway. Download a construction update with some of the anticipated work highlights for this week. April 13, 2018-5:30 p.m. -Crews continue to make repairs to the broken water main that resulted in a temporary water shutoff this afternoon (Friday, April 13), affecting businesses around E. Maple between Old Woodward and Woodward. Due to the complexity of the repair work, it is anticipated that water service could be restored between 6:30 p.m.-7:00 p.m. tonight (4-13-18). The City thanks you for your patience as it works to solve this problem as soon as possible. April 13, 2018 - 4:30 p.m. - It's been a productive third week on the Old Woodward Reconstruction Project. Contractors continued digging with work being done on new sewers, gas main installation and fiber optic connections. In addition, overhead traffic signals at Maple and Old Woodward as well as at Brown and Old Woodward are in the process of being removed. Temporary signage urging drivers to watch out for pedestrians is being placed at the respective intersections. Pedestrians are reminded to be cautious and alert when crossing intersections in or near the construction zone. Saturday (4-1418) and Sunday (4-15-18), the intersection of Old Woodward and Maple will stay OPEN this weekend, and not be closed as originally planned. Also starting this weekend, Saturday (4-14-18) and Sunday (4-15-18), the City will begin providing FREE parking in all City parking structures on Saturdays in addition to the regular free parking that has been a mainstay on Sundays in Birmingham. The public is encouraged to visit downtown and support the city merchants during the reconstruction of Old Woodward, anticipated to take approximately four months to complete. April 13, 2018 -Due to an unexpected emergency this afternoon (Friday, 4-13-18), there will be a temporary water shutoff affecting businesses around E. Maple between Old Woodward and Woodward Ave. Crews are on scene making repairs at this time. As of 2:30 p.m., it is anticipated the water shutoff will last about one-two hours. Maple Rd. will remain open to traffic. The City thanks you for your patience as it works to make this repair. April 9, 2018 -The third week of the Old Woodward Reconstruction Project is underway. Download a construction update with some of the anticipated work highlights for this week. Demolition and removal of concrete on Old Woodward is largely completed. The installation of a gas main north of Maple will continue into early next week, with connections to nearby buildings to be made. The westbound Maple Road detour, starting at Park St. and circling around the construction zone, goes into effect Monday, April 9, 2018. The westbound detour will remain in place the majority of the project. Parking options on the detour include the valet station at Hamilton near Ferndale (first two hours free), the Park Street parking structure and the N. Old Woodward parking structure. Eastbound Maple remains open to through traffic. The intersection of Brown and Old Woodward will be closed to through traffic Saturday, April 7 and Sunday, April 8 for the installation of a sewer in the middle of the street. It is anticipated the work will completed by Sunday evening. Pedestrians will be able to cross the street at designated areas. In addition, on Monday, April 9, westbound Brown will be closed as contractors prepare for upcoming, necessary pavement work. Eastbound Brown will remain open. A detour will be set-up for through traffic using Woodward, Lincoln and Pierce. On Saturday, April 14 and Sunday, April 15, the intersection of Maple at Old Woodward will be closed in order to allow for difficult underground work to be done. Thank you for your patience as we work to transform the underground functionality and the above-ground aesthetics of downtown Birmingham for decades to come. 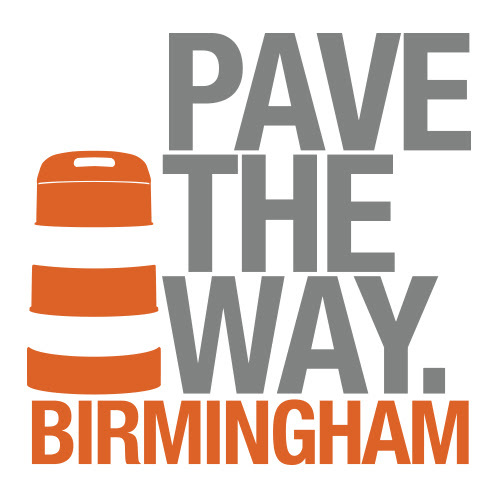 Stay Informed: Learn more about the project at www.bhamgov.org/downtowninfrastructure. Receive real time updates by email or text by signing up for an e-notify system for the project at www.bhamgov.org/enotify. Businesses are OPEN during construction and need your support. Enjoy free valet, Birmingham Bonus Bucks, an Art Contest and more! April 5, 2018 -As part of the Old Woodward Reconstruction Project, Consumers Energy has installed a new gas main at Old Woodward and Willits this afternoon (4-5-18). As part of the process, the new gas main is connected to the old gas main. Natural gas is introduced to the pipe that will result in a strong smell of natural gas for a short, undetermined period of time, expected to occur at about 3:45 p.m. this afternoon. The Birmingham Fire Department will be on scene during this event as a precaution. The City thanks you for your patience as part of the reconstruction of Old Woodward Ave.
April 2, 2018 - The second week (4-2-18 to 4-7-18) of the Old Woodward Reconstruction Project is off to a strong start. Digging is underway as crews are removing concrete throughout the construction zone. It is also anticipated that contractors will be doing underground infrastructure related work for most of the week, north of Maple. Last week (3-26-18 to 3-31-18), contractors milled and removed pavement on Old Woodward from Oakland to Brown. In addition, sewer lining work was done at night to minimize inconvenience to the public. Real time updates on the project are available by email or text by signing up to city’s enotify system at www.bhamgov.org/enotify. The project is anticipated to take approximately four months. The transformative project to reconstruct underground infrastructure and enhance above ground streetscape on Old Woodward between Oakland and Brown will start on Monday, March 26, 2018 with the closure of Old Woodward. Other activities anticipated to occur next week, weather permitting, include: milling of the asphalt surface and concrete road removal. 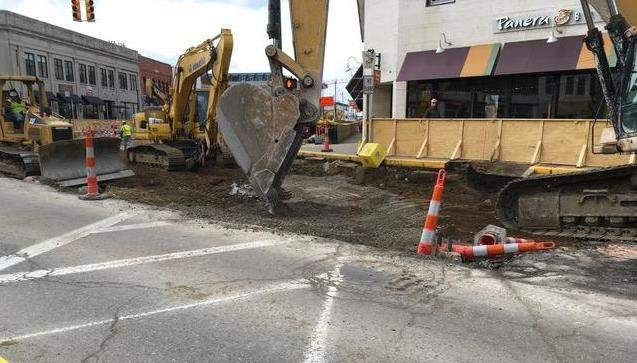 In addition, crews are expected to conduct sewer lining work along the east sidewalk of Old Woodward as well at the intersection of Old Woodward and Maple. This work will be done in the evening between 8:00 p.m. and 8:00 a.m. in order to be as minimally disruptive as possible. It is expected the sewer lining work will take about four days. The City thanks you for your patience as it executes years of planning over the next four months to reconstruct Old Woodward for decades to come. Download a printable version of the construction detour map (shown below) and informational flier which was released March 23, 2018. Feel free to distribute to your friends and family. Join us for a Construction Kick-Off Celebration! When: Wednesday, March 28th at 4:30 p.m.
- Selfie Spot - construction cut-out photo opportunity! - Attendees will enjoy refreshments such as Rocky Road Cupcakes from the Cupcake Station! We look forward to seeing you and your family on Wednesday, March 28th at 4:30 p.m.! Please note due to pleasant weather conditions, safety barriers are currently being assembled a couple days ahead of schedule. The road will remain open all week, with projected closures beginning Monday, March 26th. The City released the Old Woodward Reconstruction Project Master Map below, showing the following elements: construction zone, open sidewalks, plywood dividers, pedestrian crossings, parking structures, free 2-hour valet parking stations, the valet route and traffic flow. Download the map here. Also, please note sewer lining work originally planned for this week will now take place next week, March 26 - 30 from 8:00 p.m.-7:00 a.m. Crews will be lining a long sewer along the east sidewalk of Old Woodward between Oakland and Brown. Similar work will also be done on a shorter sewer line along Maple Rd. during the same overnight hours. Weather permitting, the work is expected to take about four days. Birmingham City Manager Joe Valentine and BSD Executive Director Ingrid Tighe appeared on "Making a Difference at the Community House" with William Seklar, the President and CEO of The Community House. They spoke in depth about the upcoming Old Woodward Reconstruction Project, with details about below ground infrastructure improvements, above ground enhancements, the Pave the Way program, incentives for shoppers and plans to communicate the message that downtown is open for business during Old Woodward Reconstruction. Watch the video online here. The Old Woodward Reconstruction project is set to begin within the next few weeks. It is projected that safety barriers will be assembled on Wednesday, March 21st, and the road is projected to close on Monday, March 26th. Thank you to the Hometownlife Observer & Eccentric for their article detailing the project kickoff timeline, incentives for shoppers, and upgrades that will transform the underground functionality and the above-ground aesthetics of downtown Birmingham for years to come. Please be sure to look at the new rendering of what Old Woodward will look like at the top of this page. We are paving the way for a more beautiful downtown! Please note sewer lining work originally planned for this week will now take place next week, March 19 - 23 from 8:00 p.m.-7:00 a.m. Crews will be lining a long sewer along the east sidewalk of Old Woodward between Oakland and Brown. Similar work will also be done on a shorter sewer line along Maple Rd. during the same overnight hours. Weather permitting, the work is expected to take about four days. The city is targeting the last two weeks of March for the start of the Old Woodward Reconstruction project. Reminder: Receive regular updates about this project by signing up for the "Old Woodward Reconstruction General Information" group at www.bit.ly/bhamnews. Residents are also encouraged to sign up for an e-notify system for the project at www.bhamgov.org/enotify to get real time updates by email or text. Sewer lining work in coordination with the upcoming Old Woodward Reconstruction Project is anticipated to take place the week of March 12- 16 from 8:00 p.m.-7:00 a.m. Crews will be lining a long sewer along the east sidewalk of Old Woodward between Oakland and Brown. Similar work will also be done on a shorter sewer line along Maple Rd. during the same overnight hours. Weather permitting, the work is expected to take about four days. By doing this work now, the City is anticipating it will have to do less digging when construction begins on Old Woodward later in March. If you have questions or concerns, please contact the City Engineering Dept. at (248) 530-1840. With the reconstruction of Old Woodward Ave. approaching, the City is in the final stages of its complimentary Structural Building Inspection by Video initiative. More than half the businesses in the project area (Willits St./Oakland Ave. to Brown along Old Woodward), has received the complimentary video inspection by a city contractor prior to the start of the Old Woodward Reconstruction Project. If you are interested in receiving this service, you are encouraged to contact the City Engineering Dept. as soon as possible at (248) 530-1840. A Merchant Meeting was held on Thursday, March 8, 2018 at Be Well Lifestryle Center, located at: 750 S Old Woodward Ave, Birmingham, MI . If you were unable to attend the meeting, view the March 8, 2018 Merchant Meeting Presentation. The City, in conjunction with the Birmingham Shopping District (BSD), would like to thank the merchants and stakeholders who attended Merchant Meetings held on 2-8-18. If you were not able to attend the February meeting, you may view the Merchant Meeting PowerPoint presentation for 2-8-18. The next Merchant Meeting is scheduled for Wednesday, April 11, 2018, at Vinotecca Wine Bar and Restaurant 210 S. Old Woodward Ave. in Birmingham from 8:30 a.m.-9:30 a.m. The City of Birmingham in conjunction with the Birmingham Shopping District (BSD) held a Merchant Meeting on 1-11-18 at the Community House in Birmingham. If you were unable to attend that meeting, you may view the Merchant Meeting PowerPoint presentation for 1-11-18. Also in January, the City of Birmingham City Commission approved the recommendation of a contractor for the 2018 Old Woodward Avenue Reconstruction Project at the commission meeting held on Monday, Jan. 8, 2018. In October, and the City and the BSD held a fourth Meeting Meeting to discuss the latest planning for the Old Woodward Ave. Reconstruction Project on Oct. 27, 2017. If you were unable to attend the session, you may view the Merchant Meeting Oct. 27, 2017 power point presentation. The City of Birmingham held a third informational meeting for businesses in Downtown Birmingham on April 27, 2017 to provide an update on plans for the reconstruction of North Old Woodward. If you missed the meeting, you may view the informative power point presentation: Merchant Meeting, April 27, 2017. The City of Birmingham held its second informational meeting on February 28, 2017 for businesses to provide an update on plans for the reconstruction of Old Woodward. The City reviewed the final plans and plan logistics for the project along with known timelines and features for future ongoing communications. To view the presentation, go to: Informational Meeting for Businesses - Feb. 28, 2017. On November 15, 2016, a meeting was held to provide merchants, business owners, and building owners information about this project, with an emphasis on how business access will be maintained and helped during the project. Presentations were prepared from both the Engineering Dept. and the Birmingham Shopping District. A link to these presentations are listed below. Businesses can sign up to receive updates regarding the project by signing up for the "Old Woodward Reconstruction News for Businesses" group at www.bit.ly/bhamnews. Stay Informed: To receive regular updates on the project, sign up for the "Old Woodward Reconstruction General Information" group at www.bit.ly/bhamnews. You are encouraged to revisit this webpage for regular updates on this project as it evolves over the coming months and years. The continued investment in the City’s infrastructure will ensure Birmingham remains a viable and desirable location for many years to come. Due to an unexpected emergency this afternoon (Friday, 4-13-18), there will be a temporary water shutoff affecting businesses around E. Maple between Old Woodward and Woodward Ave. Crews are on scene making repairs at this time. As of 2:30 p.m., it is anticipated the water shutoff will last about one-two hours. Maple Rd. will remain open to traffic. The City thanks you for your patience as it works to make this repair.